Her Royal Highness The Princess Royal officially named a new Royal Research Ship - RRS Discovery - at the National Oceanography Centre Southampton (NOCS) (Thursday 10 October). RRS Discovery is a state-of-the art platform for world-leading oceanographic research and represents a £75 million investment in frontier science by the Department for Business Innovation & Skills. 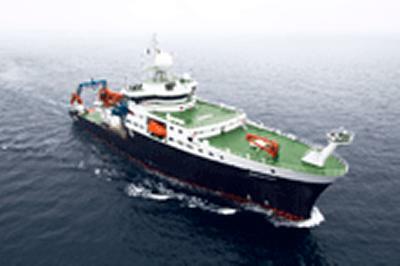 Commissioned by the Natural Environment Research Council (NERC) and operated on NERC’s behalf by the National Oceanography Centre (NOC) for the United Kingdom’s marine science community, Discovery’s wide capability will allow deep-ocean research in the remotest and least hospitable parts of our planet, from tropical seas to polar waters. At almost 100-metres in length, and with a displacement of 6,075 tonnes, Discovery will carry a marine crew of 24 and has accommodation for 28 scientists and technicians. The ship is fitted with a comprehensive suite of laboratories, handling systems and sensors that will enable her to carry out research spanning a wide range of ocean issues that impact on society. Southampton scientists from NOCS, which is the integrated collaboration between the Southampton-based-part of NOC and the University of Southampton’s Ocean and Earth Science, will help RRS Discovery play a key role in the scientific mission to understand the role of the oceans in the Earth system. It will enable scientists to carry out research that will deliver significant economic and societal benefits – particularly in areas including climate change, ocean acidification, the impact of human activity on delicate ecosystems, mapping earthquakes and underwater landslides and investigating fascinating features such as hydrothermal vents. Scientists will be able to sample and measure the properties of the atmosphere above the ocean surface, the water column itself and the seabed of the deep ocean. One of the first scientists from Ocean and Earth Science to embark on a large research project on Discovery is Dr Martin Solan, who is one of four lead Principal Investigators for Southampton on the Shelf Sea Biogeochemistry research programme, co-funded by NERC and DEFRA. Focussing activity in the Celtic Seas, the aim of the £10.5 million programme is to reduce the uncertainty in our understanding of nutrient and carbon cycling within the shelf seas, and of their overall role in global biogeochemical cycles and will provide important advice to policymakers. The first shelf sea biogeochemistry cruise will leave Southampton in March, 2014. Dr Solan says: “Our research programme was designed around the new capabilities that Discovery affords to us, allowing over 60 scientists from a variety of scientific fields to work together to address globally important issues. The vessel will also be used to deploy submersible equipment, such as the Isis remotely operated vehicle, or NOC’s fleet of Autosub autonomous underwater vehicles, all of which are part of the MARS (Marine Autonomous & Robotics Systems) facility – one of Eight Great Technologies identified as crucial to the UK’s future prosperity. The arrival of Discovery, the latest addition to NERCs fleet of research vessels, means that tonne for tonne, the UK has the largest scientific provision of this kind of any of the G8 nations. Discovery is the latest in an illustrious line of vessels bearing the name that date back to 1602 when the East India Company commissioned the first recorded Discovery to explore the waters now known as the Hudson Strait in the long search for the North-West Passage. In the 20th Century a new Discovery was specially commissioned for the British National Antarctic Expedition of 1901-04, that included Antarctic heroes Captain Scott and Ernest Shackleton. The new ship’s immediate predecessor ended a 50-year career in 2012, and was the platform for some of the most important marine science carried out during that period – truly a half-century of discovery.